Amgen Tour of California Jersey Design Contest Winner Announced - SoCalCycling.com - Southern California, Cycling, Cycling News, Amgen Tour of California, Bicycle Racing, Fun Rides, Cycling Event Schedules, Mountain Biking, Cyclocross, Cycling Photos, Cycling Videos, Interviews, Product Reviews. Worthy Brewing Introduces Labor Power Red Lager – Roll Labor! Martinez, California resident Matt Orendoff has been selected as the winning designer of the 2013 Amgen Breakaway from Cancer® Most Courageous Rider Jersey. It was announced by Kristin Bachochin, Race Director of the 2013 Amgen Tour of California professional road cycling race and Vice President of AEG Sports, presenters of the annual international cycling event. This special and traditional jersey is awarded after each of the race’s eight stages to the professional cyclist who best exemplifies the character of those engaged in the fight against cancer – courage, sacrifice, inspiration, determination, and perseverance. 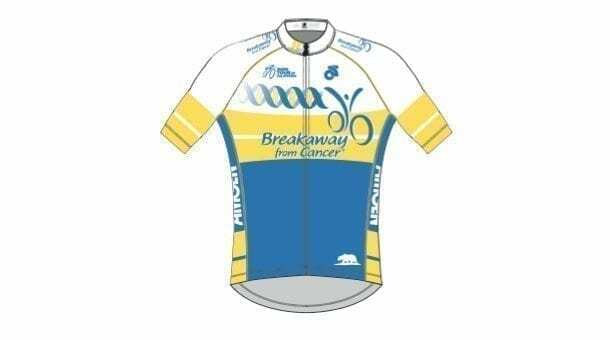 Earlier this year, AEG sponsored a design contest for the 2013 Amgen Breakaway from Cancer® Most Courageous Rider Jersey. Orendorff’s artwork prominently features the Breakaway from Cancer logo and a clean, sharp race-inspired design. It was chosen from a pool of submissions and determined by the following criteria: creativity (50 percent), use of colors and elements (25 percent), and choice of theme (25 percent). Official jersey supplier Champion System will produce this specially designed jersey, and CREATE.IT, a crowdsourced talent discovery platform, is the online promotional partner that hosted the contest. A Chico State graduate with a bachelor’s degree in English, Orendorff began his career in publishing before transitioning into print and graphic design. He works mainly on bicycling-related jobs for local bike shops and racing clubs. The prize package includes a trip for Orendorff and one guest to one stage of the 2013 Amgen Tour of California, including round trip airfare, hotel accommodations, VIP Hospitality passes to the respective stage of the race, an Amgen Tour of California merchandise package, and the opportunity to meet the Most Courageous Rider winner of the stage following the awards ceremony. The 2013 Amgen Tour of California is set to cover approximately 750 miles from southern to northern California May 12 – 19, and will feature United Cycling International (UCI) Pro, Pro Continental and Continental squads. The 16 world-class teams chosen to participate in the eighth annual race will include Olympic medalists, Tour de France competitors and the reigning world champion.